BOSTON -- For the third time in five quarters, convenience-store chain Ricker’s had the highest ratio of footfalls per station in the country, according to a new study by GasBuddy and Cuebiq. 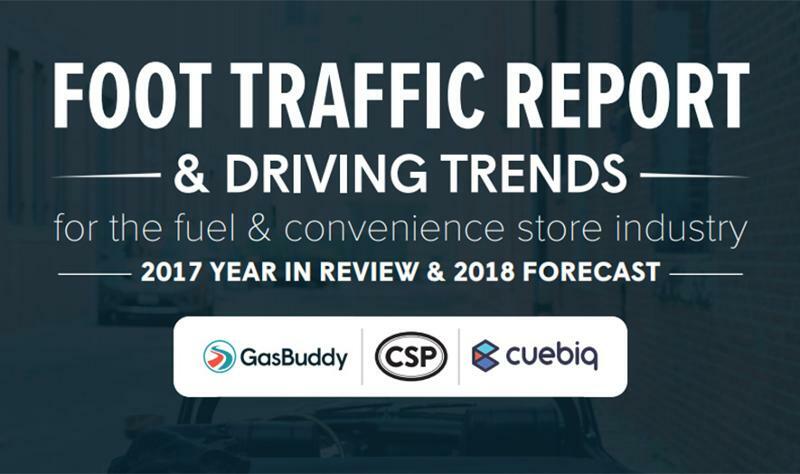 GasBuddy, a smartphone app connecting drivers with fuel outlets, and Cuebiq, a location intelligence company, recently conducted their latest quarterly joint study examining foot traffic of GasBuddy users at c-stores and gas stations across the country. This study analyzed trends and insights from nearly 121 million consumer trips in 2017 and features a convenience retailing forecast by the CSP team. Click here to see the complete report from the study. Leveraging Cuebiq’s proprietary intelligence platform and data collection methodology, the companies analyzed anonymous geo-behavioral patterns of GasBuddy’s app users, which allowed them to gain insights into its users’ offline behavior, such as frequency of station visits, fueling patterns, how long they spend at a location and brand loyalty. They then offered recommendations to make these insights actionable for retailers. 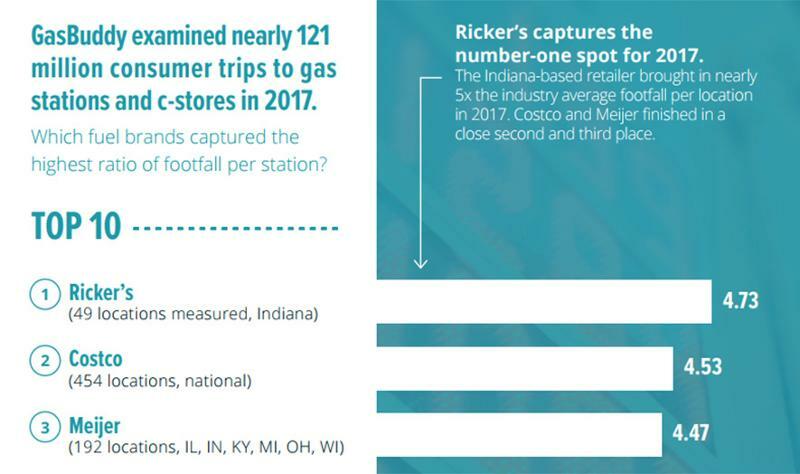 Anderson, Ind.-based Ricker’s captured nearly five times the c-store industry average of footfalls per station—which normalizes at 1—with 4.73. In the study, "footfalls" is defined as users who spend anywhere between two and 30 minutes in a 30-meter area around the gas station; a purchase is not required. Issaquah, Wash.-based retailer Costco and Grand Rapids, Mich.-based supermarket Meijer’s took second and third, with 4.53 and 4.47 footfalls, respectively. While Meijer’s took the top spot during the third quarter of 2017 and Costco did so in the fourth quarter, Ricker’s won in both Q1 and Q2. 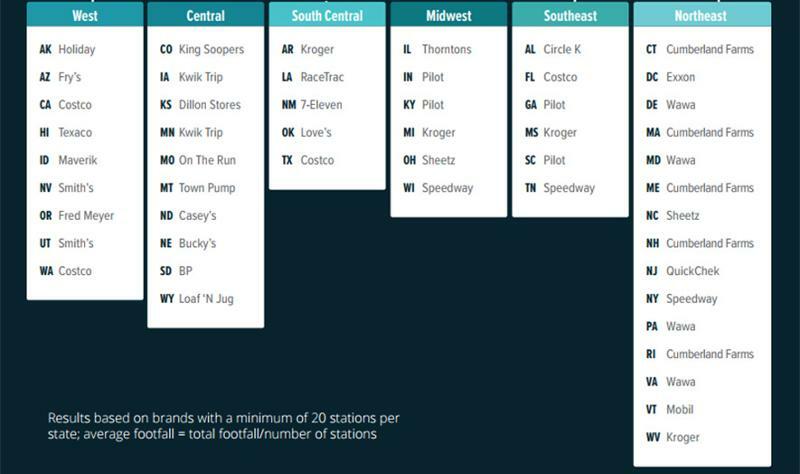 Fuel brands with 30 or more locations were measured when compiling these rankings. When compiling the brands with the highest average footfall by state, Framingham, Mass.-based c-store chain Cumberland Farms led the way as the top chain in five states. Wawa, Pa.-based chain Wawa, Cincinnati-based supermarket Kroger and Costco, Issaquah, Wash., all tied for second place as the top brand in four states. Results for this section of the report took brands with a minimum of 20 stations per state into account. GasBuddy and Cuebiq suspected a correlation between the quality of lighting and visits, considering 90% of the approximately 30,000 stations that the report analyzed are open 24 hours. And they were right. 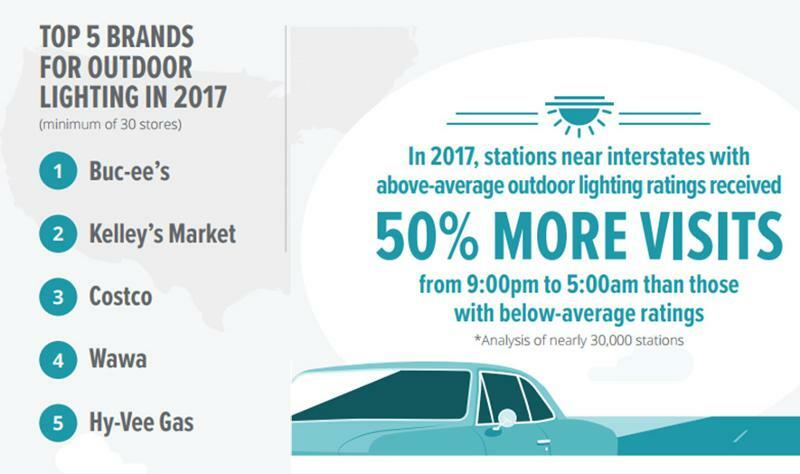 Last year, stations near interstates with above-average outdoor lighting ratings on GasBuddy saw a 50% increase in visitation between 9 p.m. and 5 a.m., compared to those with below-average ratings. The top brands for outdoor lighting in 2017 were Lake Jackson, Texas-based c-store Buc-ee’s, Rockford, Ill.-based Kelley’s Market, Costco, Wawa and West Des Moines, Iowa-based Hy-Vee Gas. 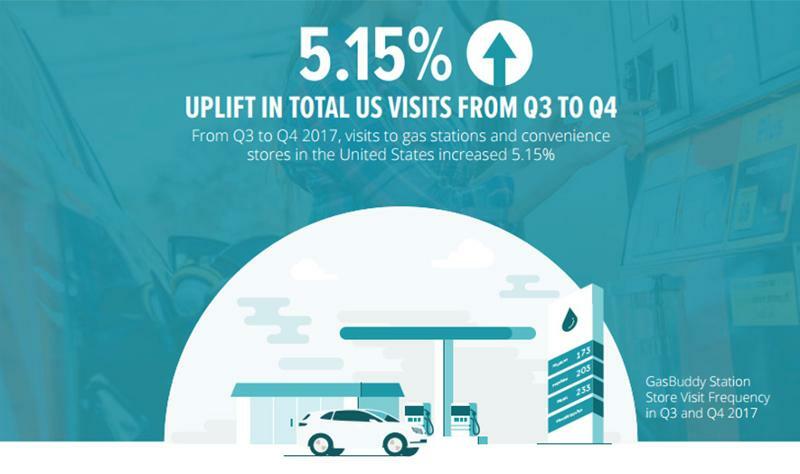 C-store and gas-station visits increased 5.15% from Q3 to Q4 2017. The data reveals that Fridays at noon had the highest average levels of foot traffic in 2017. Lunch hours were most hectic during weekdays and were especially busier than early morning. 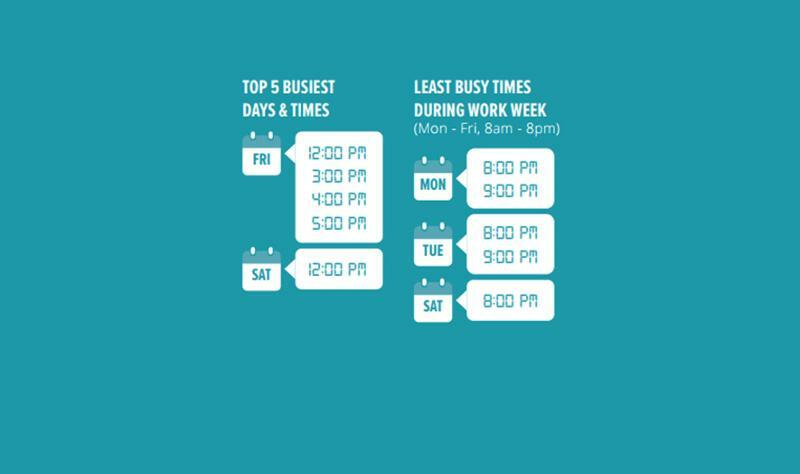 Little changed during major holidays; Wednesday, Friday and Saturday were the busiest days, while noon through 5 p.m.—excluding 2 p.m.—were the busiest times. Consumers emphasize proximity when it comes to visiting retailers. 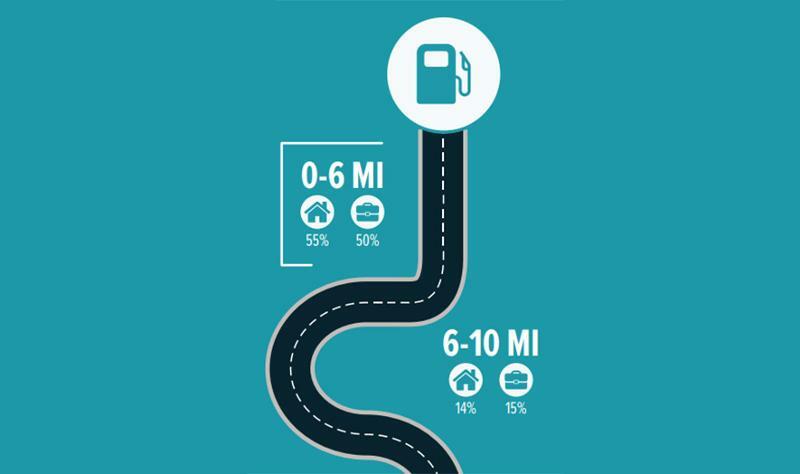 During Q4 of last year, more than half of GasBuddy users (55%) went only to c-stores or gas stations that were within 6 miles of their homes, and 50% stayed within 6 miles of their workplace. Only 6% and 7% stayed within 15-20 miles of home and work, respectively.